The festive character of the uprisings sweeping across North Africa and the Middle East has been widely noted (see previous post on Egypt). Just as Hobsbawn wrote of earlier revolutions, everything seems possible as the old regimes crumble and people have literally been dancing, as well as fighting, in the streets. 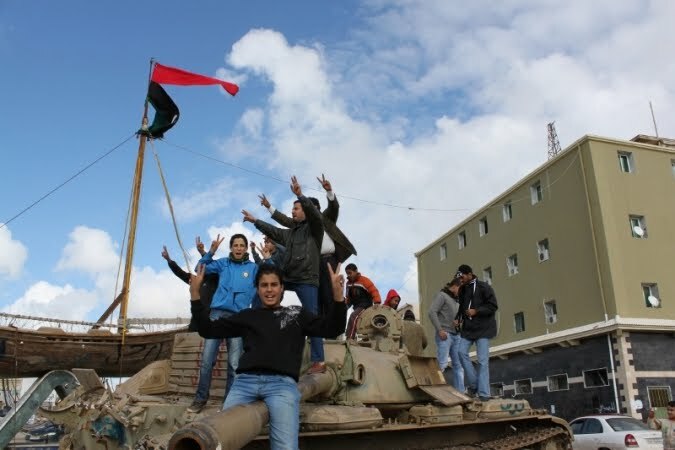 In Libya at the moment it is the fighting that is dominant, hopefully victory and further celebrations won't be too far behind. Strangely it was Gadhafi last week who called for dancing in the streets, just as his death squads were going into action across Libya. A desparate atempt to redirect the youthful energy of the uprising into a party for a murderous regime. “Communism” here means: a common creation of a collective destiny. This “common” has two specific traits. First, it is generic, representing, in a place, humanity as a whole. There we find all sorts of people who make up a People, every word is heard, every suggestion examined, any difficulty treated for what it is. 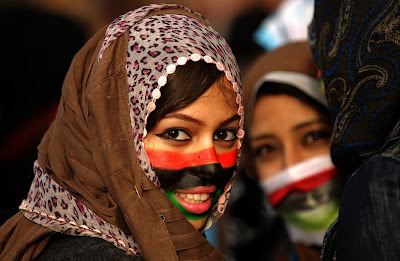 Next, it overcomes all the substantial contradictions that the state claims to be its exclusive province since it alone is able to manage them, without ever surpassing them: between intellectuals and manual workers, between men and women, between poor and rich, between Muslims and Copts, between peasants and Cairo residents. Thousands of new possibilities, concerning these contradictions, arise at any given moment, to which the state — any state— remains completely blind. One witnesses young female doctors from the provinces taking care of the injured, sleeping in the middle of a circle of fierce young men, and they are calmer than they have ever been, knowing that no one will dare to touch a single hair of their heads. One witnesses, just as well, a group of engineers entreating young suburbanites to hold the place and protect the movement with their energy in battle. One witnesses a row of Christians doing the watch, standing, guarding over bent Muslims in prayer. One witnesses merchants of every kind nourishing the unemployed and the poor. One witnesses anonymous bystanders chatting with each other. One can read thousands of signs where individual lives mix without hiatus in the big cauldron of history. All these situations, these inventions, constitute the communism of movement. For two centuries the only political problem has been how to set up in the long run the inventions of the communism of movement? (Tunisia, Egypt - The Universal Reach of Popular Uprisings) . Badiou's article also includes a great quote from Jean-Marie Gleize: “The dissemination of a revolutionary movement is not carried by contamination. But by resonance. Something that surfaces here resounds with the shock wave emitted by something that happened over there.” I like the notion of revolution as a sonic event, something that is heard and felt and sets bodies in motion, dancing and fighting. 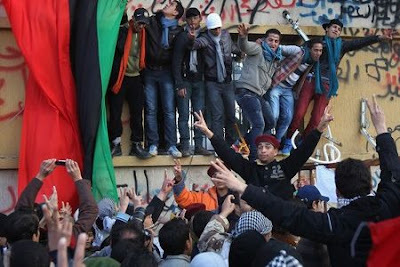 All images of celebrations in Benghazi following the overthrow of Gadhafi's rule there. "One can, for instance, communicate a movement. A tremor, a shock, a displacement of force can be communicated - that is, propagated, transmitted... What takes place, in this sense, what is transmitted, communicated, does not involve phenomena of meaning or signification. In such cases we are dealing neither with semantic or conceptual content, nor with a semiotic operation, and even less with a linguistic exchange." I've always thought this anti-semiotic understanding of communication was especially applicable to dance music: the bassline hits you, it doesn't "express" anything or tell some kind of story. Hey, we posted the same girl!